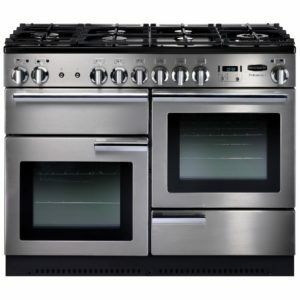 Dual fuel range cookers provide modern, efficient cooking by using electric ovens combined with the fine control of a gas hob. With many varieties of style and size available, ranging from the traditional to sleek and modern, there is a style for every kitchen. Many cookers offer extra features such as the multifunction oven, which provides cooking options such as conventional oven, fan assisted oven, fanned grilling, defrost and browning elements so each dish is cooked exactly as required. Some models offer neat storage drawers or slow cooking cavities, as well as hobs with great extras like powerful wok burners and cast iron pan supports. 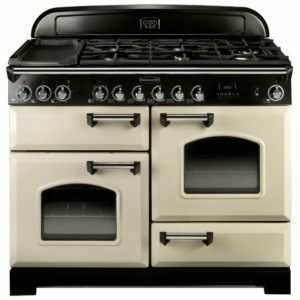 British made and fantastic quality, this Professional Deluxe range cooker from Rangemaster is the perfect buy for cooking enthusiasts. Offering two electric ovens and a five burner gas hob including a triple ring wok burner, the PDL90DFFSS/C gives you all the flexibility you need to cook up a feast. If Sunday roasts are your thing, then you'll love the HandyRack. Located on the inside of the oven door it gives you easy access to check and baste your roast to perfection. This model is finished in stainless steel, has an energy efficiency rating of A/A and comes with a two year parts and labour warranty as standard. 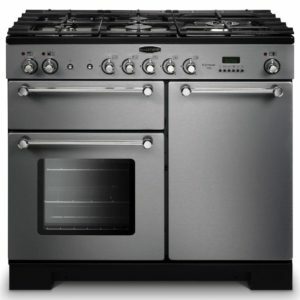 Say hello to the super-sleek Classic Deluxe range cooker with loads of features to enhance your cooking experience. 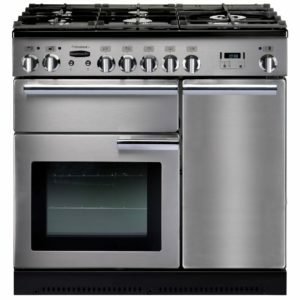 Featuring a main multifunction oven, a tall electric oven, a smooth action glide-out grill and a five burner hotplate you'll have all you need to cook up a feast. Plus with great added extras like the handy rack, you'll find roasting meat a breeze. The rack is located on the inside of the oven door, making it easy to check and baste your roast to perfection. 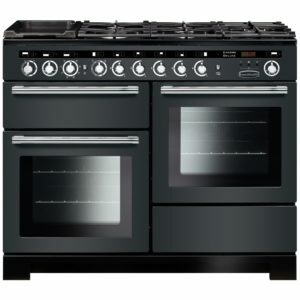 Finished in black with a chic country feel this model is bound to make a statement in your kitchen. Half Price Matching Hood And £150 Cashback! We love the Encore Deluxe for its sleek looks and clean lines, and the slate finish with chrome trim really stands apart from the crowd. Featuring 2 great capacity ovens, there's plenty of versatility, particularly with the multifunction main oven, which offers a great selection of cooking options. 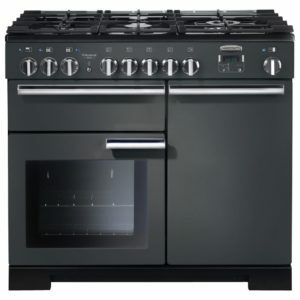 Gas cooking is always popular thanks to its fine control, and the 5 burner gas hob on this cooker provides all that control with room for even your largest pans. 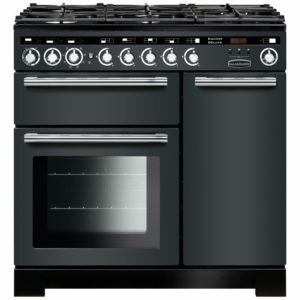 This Professional Deluxe dual fuel range cooker in slate will bring a professional feel to your kitchen. With two ovens, a separate grill and a 5 burner gas hob complete with wok cradle and griddle, you will be ready to take cooking to a new level. You will be able to astound friends and family with your inner chef! 155 litres of oven space split between 2 ovens, a main multifunction oven and tall fan oven, will give so much more flexibility to your cooking. You won't have to worry about time wasted cleaning all that oven space as they have catalytic liners so a simple wipe down is all that is required. 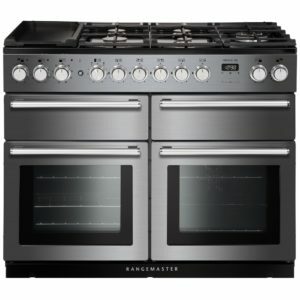 Rangemaster are renowned for producing professionally inspired cookers which bestow cooking excellence wrapped up in stunning design and yet are durable and reliable. Pure genius! 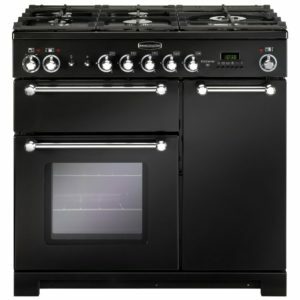 Sleek style and great features really make this 110cm wide range cooker from Rangemaster stand out. There's plenty of space with the multifunction main oven, secondary electric oven and glide out grill. And plenty of flexibility too! The five burner gas hob with wok burner adds great cooking options and character. Finished in modern slate with chrome trim this cooker looks brilliant as well. It is covered with a two year warranty as standard and an A/A energy rating for extra peace of mind. 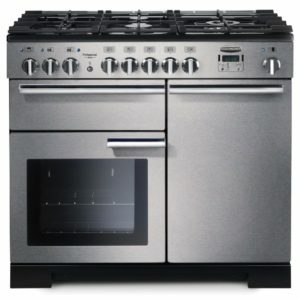 Want a range cooker, but not sure if you want dual fuel? Head over to our full selection of range cookers to choose from more options. 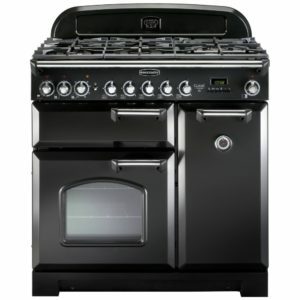 We have outstanding cookers from the likes of Belling, Smeg and Rangemaster. 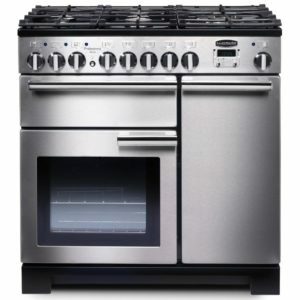 We also have collection of built in ovens, hobs and microwaves in our cooking section. Head over to the extraction section to see the great cooker hoods that you could match your new oven to. Our range of American-Style fridge freezers is not to be missed. Head to the refrigeration appliances to see it. With our new Multibuy feature, you can kit out your kitchen all at once and make savings too. See how much you can save!